Dana Boyer spent years as an artist, specializing in faux, custom, and airbrush painting. Several years ago she wanted to paint her own floor and turned to concrete experts for advice and a quick training. She's been using concrete as her medium ever since. Boyer is the owner of ConcretiZen, based in Apache Junction, Arizona. She provides a variety of residential and commercial services, including staining, overlayments, stucco staining, resurfacing, polishing, sandblasting, stamping, texturing, and engraving. She's also branching out with countertops, and continues to pursue specialty applications and art pieces. Boyer admits she's eager to add anything and everything to her repertoire of services. "I can do anything. If it can be dyed, stained, textured, I'll do it," she said. An artist by trade, she spent years as a painter, creating unique custom and air brush designs for myriad surfaces, including automobiles. She also worked professionally on a wide range of faux painting projects. But it was through her own home improvement project that she was introduced to — and immediately smitten by — decorative concrete. 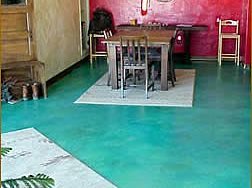 "I wanted to paint my own floor," she said, saying she sought a mini-lesson in painting concrete so she could bring her own personality to the project by creating it herself. "I ended up falling in love with it," she said. She began working with The Concretist's Mike Miller, known in the industry for reshaping attitudes about chemical stains. He experimented with new ways to use the materials and preached the value of finishes that reveal wide color ranges and subtle variations. The first large commercial project to be recognized for this approach was The Forum Shops at Caesars Palace in Las Vegas. "I got my contractor's license," she said. "Now he's in California and I'm in Arizona. I'm trying to capture the market here in my own back yard." Boyer has traveled all over the country to do everything from stamped countertops in the Napa Valley to unique floors in Pennsylvania to a potential upcoming public works project in Texas. And requests continue to run the gamut. "A lot of people are requesting art panels, one asked for airbrushing on the floors — all kinds of crazy things," she said. And that's what Boyer loves about concrete — and it's what continues to inspire her over and over again. "Everything is weird and different," she said. "Just when I do something that I think can't be topped, I'll do something else and feel the same way." One of the projects that stands out in her mind is a Pennsylvania home in which the floors were handpainted. "We did dark black border with a kind of splatter paint effect," she said. "We even integrated pieces of material that looked like dog biscuits for the dog's section of the house." Another project involved stripping black tile and staining in light colors, which emitted an Asian look and feel with a lighthouse effect complete with shades of tans, greens, blues and purples illuminating at various times, depending on how the sunlight hit the floor. Boyer also created the design of a conference table for The Stamp Store, which provides decorative concrete training and materials. "We had heard of Dana's work, so we knew she was an accomplished artist, but the results were even more spectacular than I had hoped," said the Stamp Store's Doug Bannister. Green and blue acid stains were used first followed by Boyer's use of a stains and template technique. The final accents were done with Boyer's proprietary coloring technique. The cracks in the conference table were carved alongside the template lines with the Wasp – the smallest KaleidoCrete tool. Gold was added to the cracks and carried over the edges. 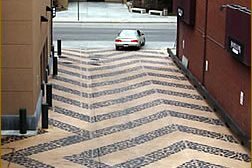 Meanwhile, one of Boyer's primary goals is to get the word out about decorative concrete. 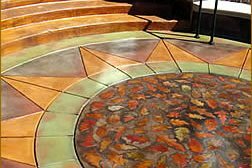 "I do expect decorative concrete to become more popular," she said. "I'm really trying to find the architects and designers to get their attention and show them the possibilities. The more I teach them, the better they can design." As an example, Boyer points to a time when designers contacted her regarding a mall project in Colorado. They had wanted an icy blue-green floor, but already had a gray surface. "Had they contacted me sooner, I could have helped them ahead of time to achieve the color they wanted," she said. She has a project in the works for Del Webb, a division of Pulte Homes. "An architect for Del Webb saw my work and spent three months trying to track me down," Boyer said. In the meantime Boyer continues to fall in love with each project she does. "All of them are my favorites," she said. 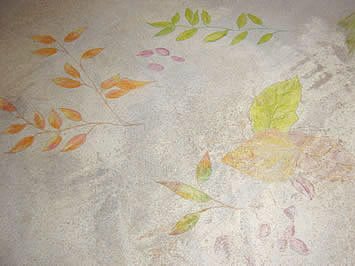 One such favorite is an overlayment with troweled-in leaves manipulated to look like linen. The common thread woven throughout all of Boyer's projects is her determination to make each project distinctive and an extension of the personality of the user or homeowner. "I always try to throw in something unique, something that is just custom for them," said Boyer. Boyer recently launched a new web site, which is providing a handful of leads. 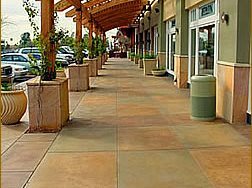 But word of mouth continues to be key as the market expands in Arizona and homeowners discover decorative concrete. "The market is really starting to grow," Boyer said. "The industry is definitely headed in a new direction. 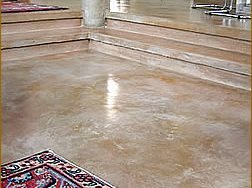 A lot of people are looking at concrete as a real option as they rip out their floors and carpeting." Michele Dawson writes each week on one of the contractor members of The Concrete Network (www.concretenetwork.com). She has written about the home building industry for several years and was on the public affairs staff of the California Building Industry Association.